Iran’s President Hassan Rouhani says Muslim people in Gaza will achieve victory against the Israeli regime, adding Tehran will always stand by all oppressed nations, including Palestinians, Iraqis and Syrians. Addressing a large crowd in the southwestern Shahr-e Kord city on Wednesday, the president added the Iranian nation supported the “brave resistance of great and patient Palestinian and Gazan people” over the past month. Muslims in Gaza stood firm in the face of bloodthirsty Zionists’ bombs and missiles, and emerged victorious, said the president. “The great, brave and resistant Iranian nation has always been ready to [defend] not only Iran’s interests but the interests of the Muslim world and the oppressed people in the world,” he added. The Israeli regime’s 29 days of relentless offensive against Gaza claimed the lives of at least 1,875 Palestinians, including 430 children, and wounded over 9,600 others. A 72-hour ceasefire took effect on Tuesday. The Israeli military says 64 of its soldiers have been killed in the conflict, but Hamas puts the fatalities at more than 150. Syria has been gripped by a deadly conflict since 2011. According to the United Nations, more than 160,000 people have been killed and millions displaced due to the turmoil that has gripped Syria. Also in Iraq, the Takfiri ISIL militants took control of Mosul in a lightning advance on June 10, which was followed by the fall of Tikrit, located 140 kilometers (87 miles) northwest of the capital, Baghdad. Tikrit has been reportedly retaken by the Iraqi army. Elsewhere in his remarks, the Iranian president said Tehran would continue its policy of “heroic flexibility” in dealing with the West, but will not surrender to big powers. 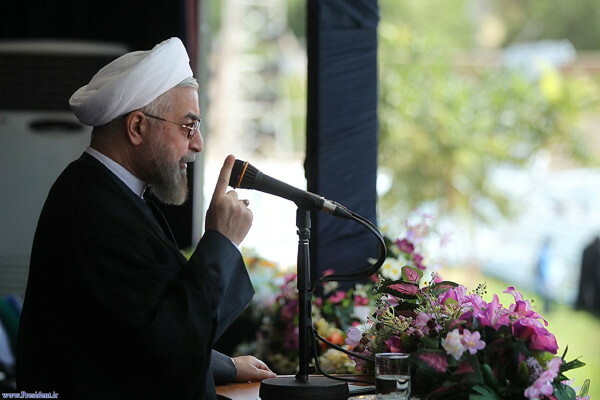 He added that the Islamic Republic would apply logic and better reasoning to redeem the rights of the Iranian nation. Rouhani touched on the country’s successful talks to have parts of its assets unfrozen, saying the release of at least seven billion dollars in Iranian assets, held tyrannically by the big powers, is a first step. “The Iranian nation will take the next steps with more power. The world knows that threats and sanctions against this great nation will have no effect,” he pointed out.